Welcome to CTM Corp, a leader in the design, manufacturing and distribution of custom and COTS (commercial off-the-shelf) transit cases. 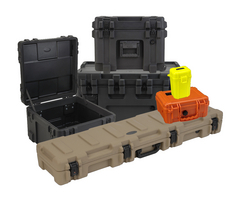 We supply shipping cases that withstand even the most severe conditions while protecting sensitive equipment. We supply transport solutions to the military, medical, security and high tech industries. Our Mission is to provide our customers with customized solutions to all of their shipping needs; and to give our customers durable and reliable shipping cases with the excellent customer service they deserve. We carry cases that are airtight, dust, and water proof, and are laboratory tested to withstand sand, wind, shock and extreme temperatures. Whether you need a case for sensitive electronic, sampling or monitoring equipment, we will help you develop a case to protect and transport your materials. We specialize in customized foam to fit any case for maximum protection. CTM Corp can engineer and produce your cases with custom interiors using state-of-the-art software and technology. Warehousing your cases for just in time delivery is a part of the valuable services we offer. Quality, reliability, and design and are essential in protecting the equipment you are transporting. We have the knowledge and experience to take your project from concept to finished product on time and within budget. Among the cases we carry are BW injection molded, SKB injection molded, SKB roto molded, Explorer injection molded, Hardigg injection molded, and Seahorse injection molded. If you don't see what you need or need to customize a case, we can get it for you. All cases are military-spec approved. For more information on military specs, Email us for more information or a quote today.